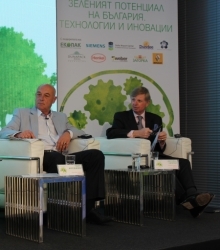 Julian Edwards – Managing Director – Europe of Tishman International gave a presentation during the Green Form – a Manager Magazine event which took place at Sofia Airport Center. He outlined the benefits of sustainable construction and its perspectives in Bulgaria. “A company entering the region is coming with the desire to operate in a cost-efficient manner. The energy saving opportunities of SAC, a LEED-certified development is one way tenants can accomplish their goal. Thus sustainable construction is of interest for Bulgaria. The availability of this type of construction will attract more international companies to open offices in Bulgaria”, said Julian Edwards. Standard building practices were discussed and compared to sustainable green construction during the Forum. While standard building practices are guided by short term economic considerations, sustainable construction is based on best practices which emphasize long term affordability, quality and efficiency. At each stage of the life cycle of the building, it increases comfort and quality of life, while decreasing negative environmental impacts and increasing the economic sustainability of the project. A building designed and constructed in a sustainable way minimizes the use of water, raw materials, energy, and land. The demand for this type of buildings is getting greater. And the Bulgarian people would benefit as well – clean green areas, healthy environment, no pollution during the construction process, protection of the existing biodiversity. Additionally, people get jobs. The construction of Sofia Airport Center A2 building have been done mainly by local subcontractors involving more than 2,000 Bulgarian workers. “The world is moving forward to producing more efficient products – technology, cars, and buildings. Bulgaria is not an exception to this trend and our company – Tishman International is happy to be the leader in the sustainable construction. We already have more than a dozen companies who have established their operations at Sofia Airport Center. This clearly shows that both Bulgarian and international companies understand the benefits of such office and logistics space” said Julian Edwards. All participants and guests at the Green Forum were welcomed in the morning by the Chairman of Tishman International Mr. Alan Levy. “What we see here is a part of the overall policy of Tishman International. All of our projects around the world are sustainable, because we believe that we have to build with a plan and a vision for the future.” said Mr. Levy while inviting the guests to enjoy the pleasant atmosphere of Sofia Airport Center. It is anticipated that when the entirety of SAC is built out close to 10,000 people will be working in an energy-efficient green environment. About Tishman International - Tishman International Companies is currently active in the United States, United Kingdom and Central & Eastern Europe including Bulgaria, Hungary, Czech Republic, Slovakia and Romania. The firm specializes, in the acquisition, development, management and financing of commercial real estate. Tishman has been a consultant and joint venture partner to some of the world’s leading institutions and private investors and has recently been appointed by a UK Fund to provide asset and development management services for a portfolio of 12 properties located in Romania, Hungary, and Slovakia. About Tishman International in Europe - In 1986, Tishman International established its European headquarters in London, England. Since then, the company has developed and managed in excess of six million square feet of premier office and commercial space in the United Kingdom. Additionally, Tishman has provided acquisition and management expertise for millions of square feet of prime real estate assets in Europe, including several Supermarket Centres in the Czech Republic for an International Supermarket Company. Its prestigious roster of clients and partners has included Metropolitan Life, New York Life, Teachers Insurance, Bank of America, Grosvenor International, Citibank, American Express, Fidelity Investments, Lend Lease, HVB Real Estate, and many others.